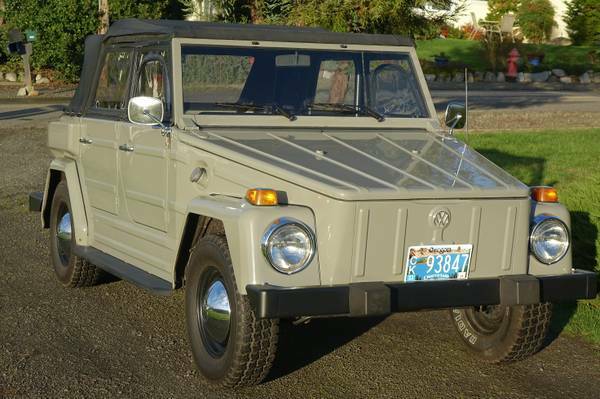 The Volkswagen Type 181 “The Thing” was an updated version of the German military’s Type 82 Kubelwagen. Rather than using the Type 82’s mechanical setup, however, the Thing rode on a combination of a Beetle driveline and a Type II Transporter suspension. Like the rest of the VW lineup, the Type 181 placed the air-cooled, 1584-cc engine in the rear and use the motor’s 46 hp to drive the rear wheels. While the Beetle had charm, the Thing was much more utilitarian. Nary a curve on the car, it had a removable top, a folding windshield, and hose-it-out practicality. While it would never be confused for a jeep, land Rover, or Land Cruiser on the trail, it could manage to stray off the pavement, and was particularly fun on the beach. Much like during its two-year production run, the Volkswagen Thing today is a quirky, eye-catching ride. Its bright and wild 1970s colors, combined with the convertible’s boxiness make it stand out in a sea of uniform cars. Models from 1974 are slightly more desirable due to their 55 hp, though condition and color tend to drive value more than model year. Top of the packing order is the visually unique Acapulco Edition, which is decked out in a blue-and-white striped Surrey top. Cars that retain their original hard top are also popular. This “Thing” started life as an Acapulco but has been repainted and the standard top and side curtains installed also a roll bar has been added. 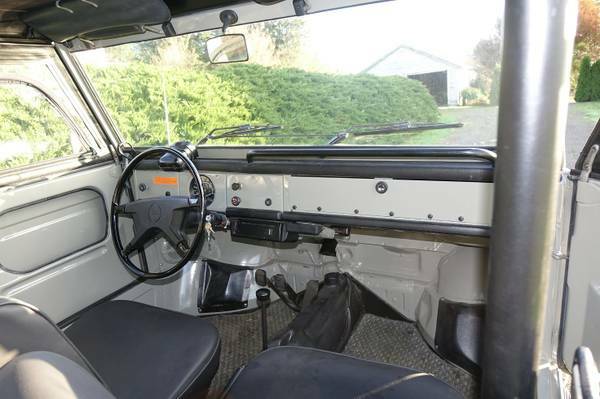 It still has the Acapulco running boards and the glove box door. The Acapulco top attaching studs are still in place. This “Thing” has been restored with a fresh rebuilt motor and a beautiful Gray Green paint job. The interior looks to be new and it also has new floor mats. Tires and brakes are also new. It’s ready to go Play. Hagerty has “The Thing” valued at $33,700.00 for a #1 and $24.300 for a #2 and $17,300 for a #3. I’m going to say that this “Thing’s” condition is some place between a #3 and 2. But you can be the judge. I have put a negotiable value of $19,000.